Call for nominations for the 2019 CITT/ICTS Awards. What's New > Call for nominations for the 2019 CITT/ICTS Awards. 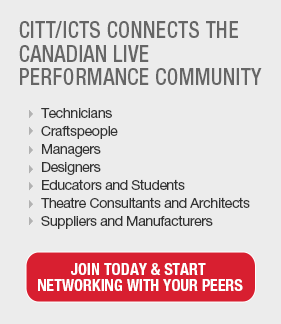 CITT/ICTS is proud to recognize individuals and companies that excel in their field of live performance in Canada. The awards will be handed out at the award banquet held on Friday, August 16 during the CITT/ICTS Rendez-vous 2019in Whitehorse, Yukon. To view the list of past recipients, please click here. The deadline to receive nominations for the 2019 awards is March 31st, 2019. Please submit your nominations by using our online nomination form!